After increased rules of engagement for U.S. forces, the U.S. strategic bomber returns to Afghanistan. The United States has resumed operations of its B-52H Stratofortress strategic bomber in Afghanistan for the first time in ten years. The strategic bomber recently flew several operations, dropping 27 munitions in various counterterrorism operations in Afghanistan. The reintroduction of the bomber may highlight the United States’ expanding role in Afghanistan and the increasing instability in the country. Goldfein indicated that the U.S. Air Force’s B-52H detachment at the Al Udeid Air Base has conducted roughly 325 strikes, dropping nearly 1,300 bombs in Operation Inherent Resolve in Iraq and Syria. The B-52H brings valuable capabilities to the fight in Afghanistan and its reintroduction on the battlefield may highlight the rising instability in Afghanistan. Capable of carrying 70,000 pounds (roughly 32,000 kilograms) worth of munitions, the aircraft can hold an array of bombs, to include 20 long-range JASSM-ERs, 80 Small Diameter Bombs, 24 MALD-Js, AGM-142 Raptor missiles, 51 500 lb bombs, 30 1,000 lb bombs, 12 joint stand-off weapons (JSOW), 12 joint direct-attack munitions (JDAM), and 16 wind-corrected munitions dispenser (WCMD). On top of its impressive payload capability, which offers much flexibility to ground commanders, the B-52H provides another added bonus especially specific to the mountainous terrain in Afghanistan. 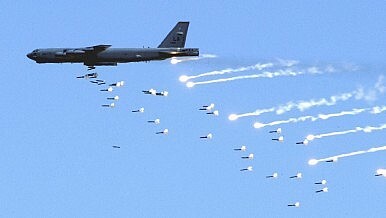 Equipped with modern and secure radios that include beyond-line-of-sight data nodes, the B-52H is capable of acting as a network node such as the Battlefield Airborne Communications Node (BACN), which would act as a relay station feeding information to ground and air assets over the country. The reintroduction of this strategic airframe may highlight changing conditions on the ground in Afghanistan. The increased rules of engagement (ROE) laid out by Obama just before the NATO Warsaw summit allow the U.S. to directly target Taliban fighters with U.S. airpower. The United States has conducted nearly 800 sorties and 140 strikes in Afghanistan since the ROE changes. With rampant instability in Helmand and Kunduz, we may see a greater and increasing role for the B-52H in Afghanistan. The U.S. Air Force plans to mothball B-1Bs and B-2s as the service is shifting funds for its new B-21 stealth bomber.